Reprint. Originally published: 2011. Board book. A first book about feelings, for very young children. How do you feel? Sometimes you feel happy, sometimes sad. Sometimes you even feel surprised. 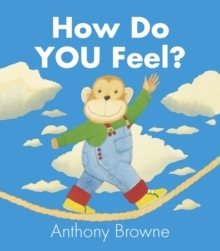 Supreme artist and Children's Laureate Anthony Browne brings all his understanding and skill to bear in this exploration of emotion for very young children. This book will reassure and help them understand how they feel, using simple words and pictures. Every parent can feel "confident" that this is the perfect book.